I had the below post scheduled prior to finding out about the shooting last night in Las Vegas, and I am simply despondent over what happened. My heart would have broken and my tears would have fallen for those who lost their lives due to this senseless violence no matter what, but as a new mother every casualty feels more cutting, every incident like this is more terrifying. I want nothing more than for warmth, love, and happiness to fill Penelope’s life. How can I keep her safe forever? 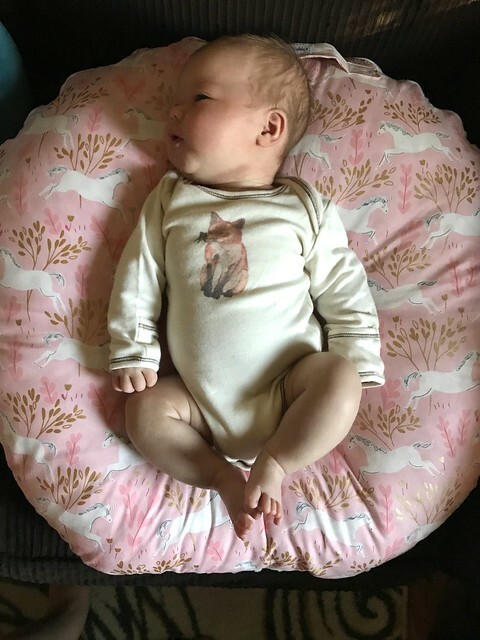 Happy one month to our little Foxlet! 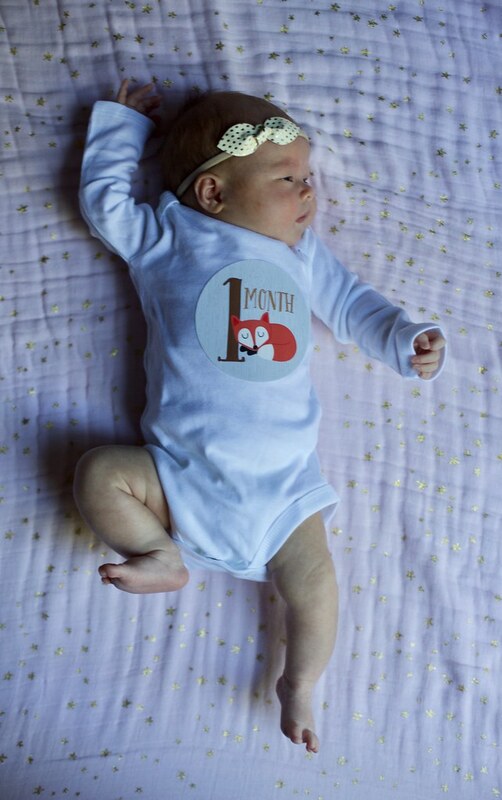 Penelope turned one month old this past Saturday, and it has truly been the best, most exhausting, most exhilarating, most phenomenal, and, above all, fastest month of our lives. Now, for those of you who have reluctantly stuck through me posting about absolutely nothing but my pregnancy and, now, new mom status, rest assured: I’m relatively sure that these 100% Penny-centric posts won’t continue forever. I mean, I recognize that with time, my life will indeed return to a level of normalcy and I’ll focus back on other aspects of my life. 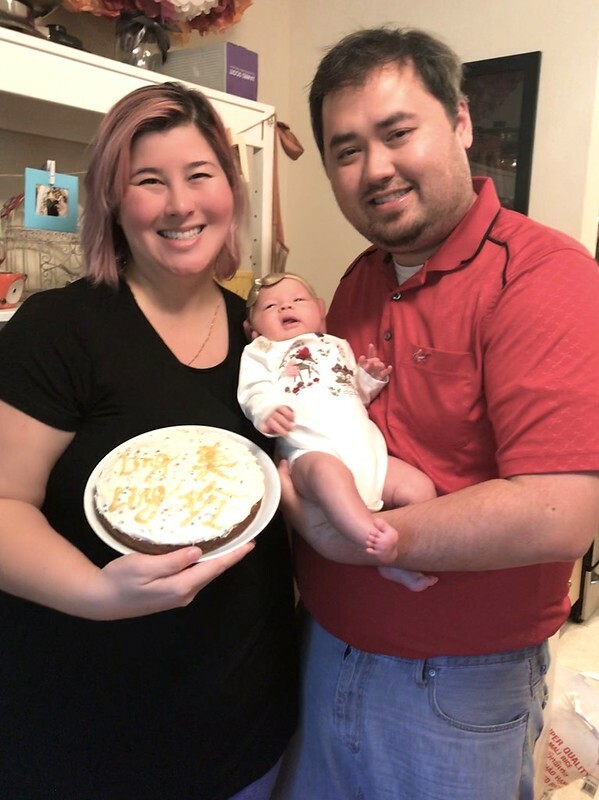 She’s been successfully kept alive for over a month now, so I am starting to at least think about returning to my blogging roots and talking about my health and weight loss goals at some point, heh. But, that being said, Penny is my new normal now, and so I’m afraid the constant barrage of cuteness is not going to stop just yet. 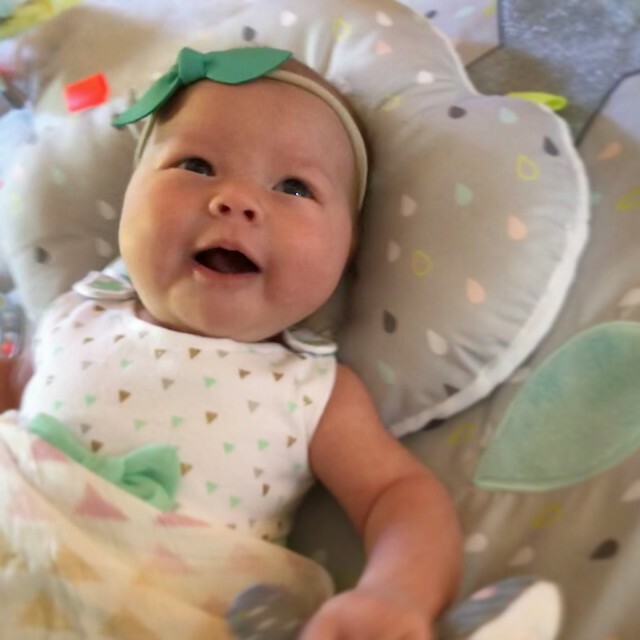 In fact, I thought that it’d be good to mention some of the ways that she’s crushing the whole growing thing, as well as toss up some of the baby items we’ve taken to over the past month. 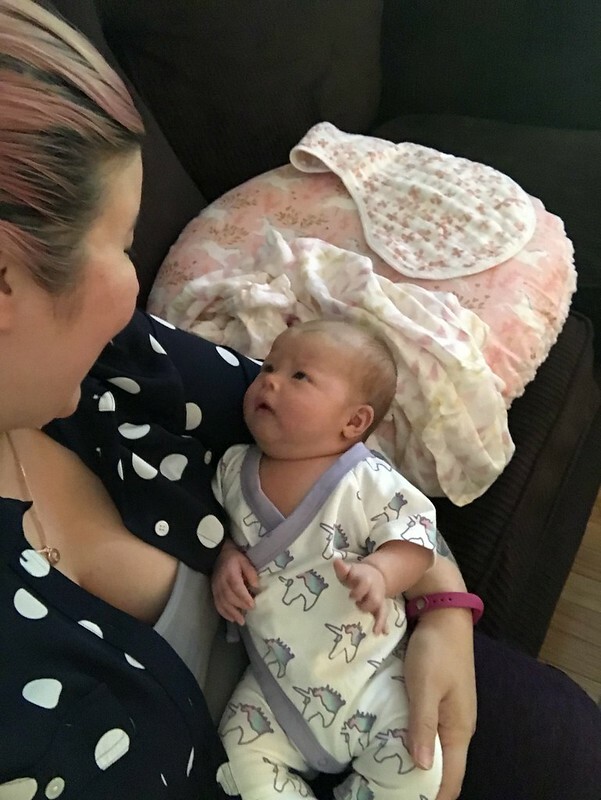 Milestones & Developments: Penny seems to be growing in leaps and bounds every day! She’s gone from being a little potted plant that does nothing but eat, sleep, and poop, to a real, actual baby, lol. 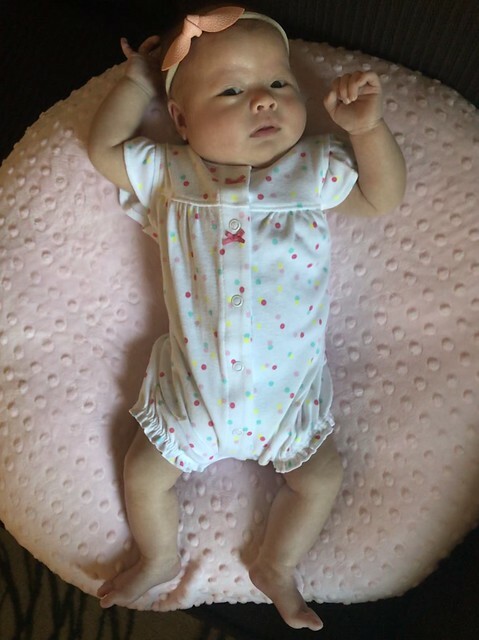 Her neck strength has gotten to the point where she can truly hold her head and even part of her upper body up for multiple seconds before going all floppy, heh. She’s sleeping slightly less and having longer periods of alertness, and definitely seems to recognize both Sean and me by sight and sound. She can hold eye contact with me and has started cooing — the best little sound in the whole world! It’s been so exciting to watch her change in front of our very eyes — her one month doctor’s appointment is tomorrow, so we don’t know her exact height + weight measurements just yet, but I can already tell she’s getting nice and hefty (yay! ), and she seems really long — her legs are almost dangling off of her Boppy lounger already! It’ll be fun to see if she ends up nice and tall like her dad and me, or if she ends up petite (like her grandmothers) instead, heh. Alas, what she is NOT doing is sleeping more than 2.5 to 3 hours at a time, even at night, but, hey, you can’t win at everything all at once, and I know that we’ve still gotten incredibly lucky with this little one so far. She has been having a bit more trouble with gas pains and has started spitting up a little more, too, which is definitely contributing to the sleep thing. But the good news is that she’s been going down much more easily in her bassinet (praise be! 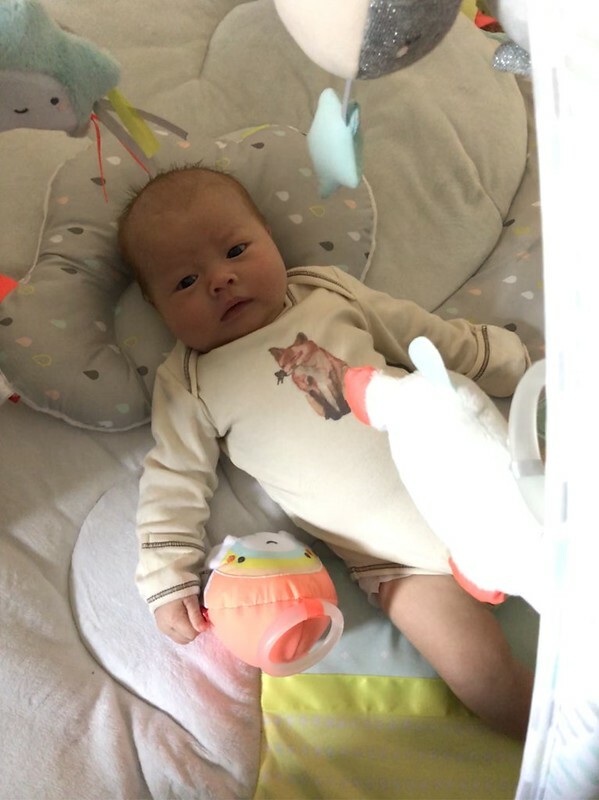 ), and even thought her spurts of sleep are still short, she’s been getting better about going back to sleep right away after eating in the middle of the night, which makes the frequent waking so much easier to deal with. 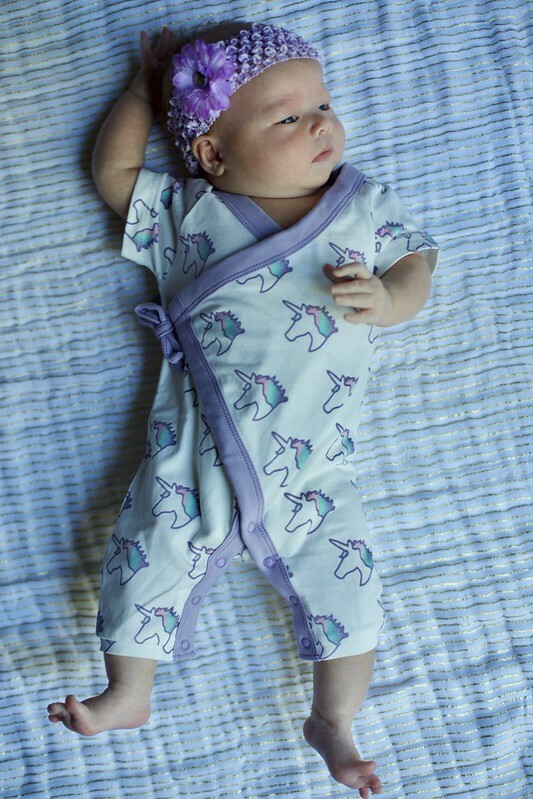 I was incredibly fortunate to be gifted a bunch of goodies from Aden + Anais by an IG follower of mine who works for the company, including these Silky Soft Swaddles which I am loooooving. They’re so pretty (a soft pink print with metallic gold details woven throughout!) and really are incredibly soft, and also have the slightest amount of stretch to them which makes swaddling Penny nice and tight a total breeze. I really like the entire Skip Hop Cloud line, but am digging the activity gym in particular for Penny right now. 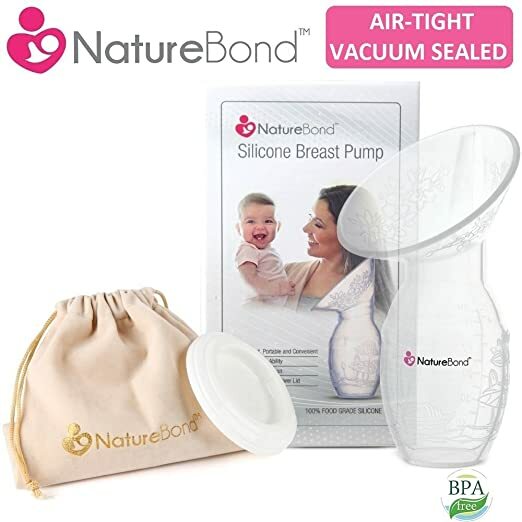 I know that as she gets older she’ll be able to interact and play with the actual toys more, but for now it’s perfect for her daily tummy time sessions, as well as providing her with a few more interesting things to look at when she’s awake. The Boppy Newborn Lounger that I inherited from my sister has been a total godsend. It’s light and portable, provides a great place to hold Penny especially when we’re out in the living room and need to set her down, and she took to it right away. The only problem is that the dogs love it a little too much too, ahahaha. That, and the fact that because Penny’s getting so long, I fear she won’t really be able to use it for that much longer! Okay, okay, okay, that’s enough baby-ness for now, I suppose. 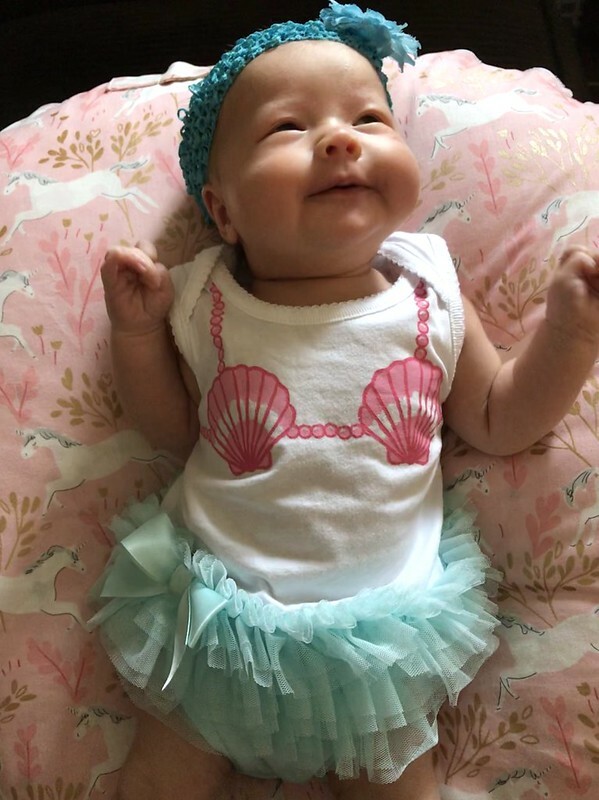 I’ll give y’all a break, but hopefully seeing some smiley pics of my happy little girl brightened up this Monday for at least some of you? For those of you who aren’t totally turned off from all this incessant cuteness, let me ask: are there any topics that you would like me to discuss with regard to my adventures in new mommydom? 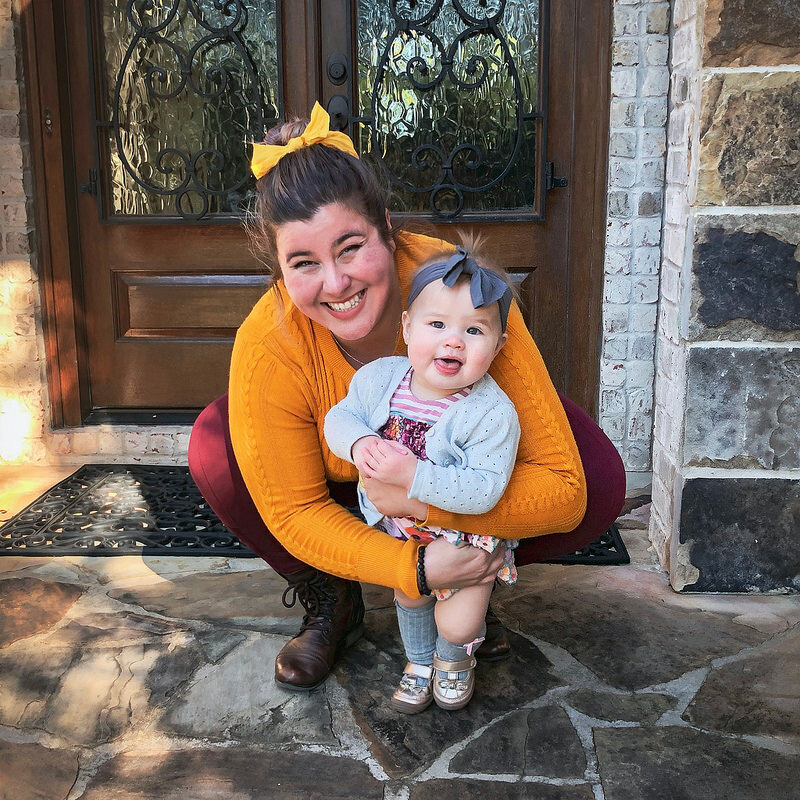 I’m obviously not an expert on anything, nor will I be anytime soon, but I do love talking and typing about my life, so let me know what most you might like to read about: dogs and babies, my feelings on my postpartum body, breastfeeding, how things have been emotionally, a day-in-the-life…? Let me know! I love all mommy details! (and i am years away from having one myself.) Penny is the cutest so no complaints here for all the photos. Love this post!! Those swaddles sound amazing. Penny is gorgeous! i’d love to hear about your back-to-work plan! What a cutie! 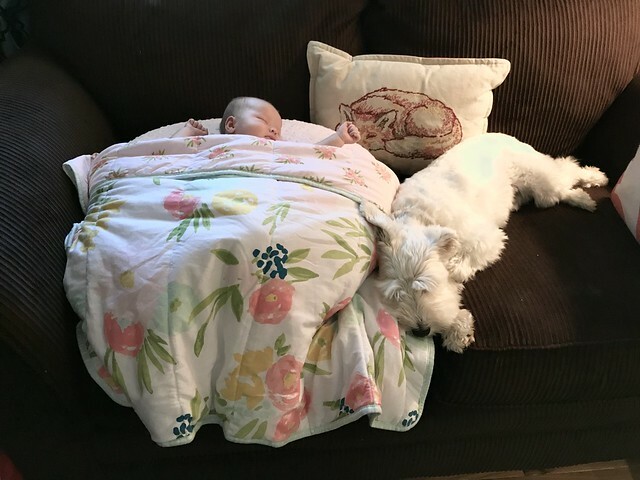 As a mom to 2 furbabies, I’d love to know how your pups are adjusting to life with their new little sister!